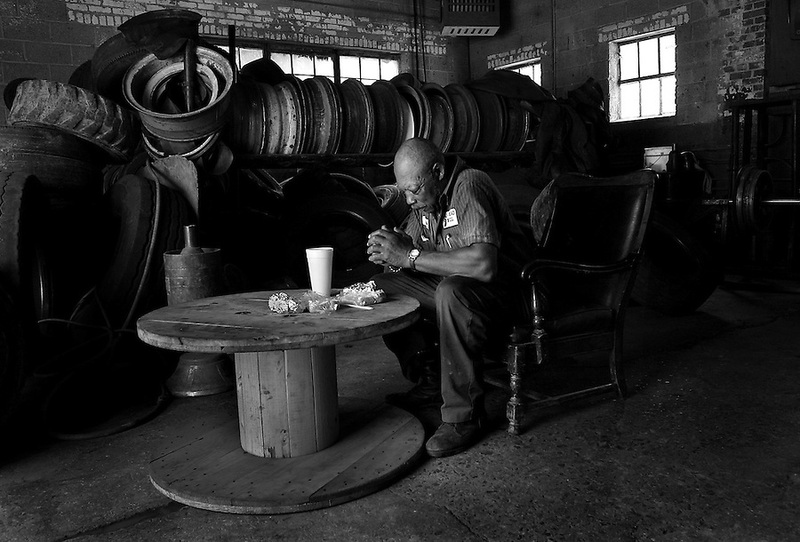 AOF.FE.080205.EDR.JPG "Gracious Lord, thank you for this food," whispered Rufus Mitchell, saying grace over lunch in his garage at Nu Tread Tire Co. in Durham where he has repaired truck tires for nearly 30 years. After replacing seven tires on Tuesday morning, Aug. 2, 2005, Mitchell clocked out for his 1-hour lunch break, scrubbed his hands with a tire brush and sat down to a relative feast of fried chicken, bread and sweet tea. "I don't have money all the time, and sometimes it's just nabs and a soda," Mitchell said, "but I always take time to thank God for meeting my needs." staff/Ted Richardson.